The vehicle is equipped with a vacuum-assisted or a hydro-boost power braking system. 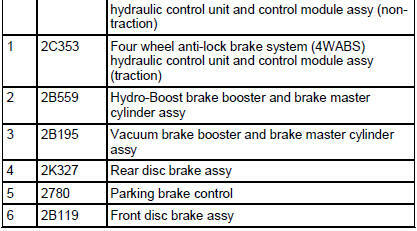 The braking system is a front-to-rear split hydraulic system. The front wheel brakes utilize a dual piston brake caliper and disc brake system. The rear brakes utilize a single piston brake caliper and disc brake system. The parking brake system is a mechanical system that is controlled by an independent hand-operated parking brake control and is self-adjusting. A 4-wheel anti-lock brake system or anti-lock brake system with traction control (4WABS) is optional equipment on all models except Cobra. Cobra has ABS and traction control as standard equipment.